This book examines the political challenge that pluralism raises to ideologies of national citizenship in contemporary Turkey. "[N]ot only does the book both inform the reader about Alevis in Turkey, but it also provides a critical analysis of this marginalized group. [W]hat is stunning is that the author fulfills this quite challenging task for a country, Turkey, whose socio-politics are, to a great extent, impenetrable, even for its residents." --Abdullah Sacmali "Middle East Media and Book Reviews Online "
"Written with rich ethnographic detail and impressive analytical force, The Reckoning of Pluralism shakes our taken-for-granted social and theoretical understandings of secular modernity, political belonging, and religious identity." --Elizabeth Povinelli "Columbia University "
"A detailed and close analysis of the paradoxes of contemporary pluralism. The focus on the Turkish Alevi--a religious minority within Islam--allows Tambar to explore in concrete terms the ways in which state authorized narratives of political belonging at once enable inclusion and perpetuate the subordination of difference. Ironically, acknowledging the Alevi's place in Turkey's history requires a deliberate forgetting of the specificities of their collective experience. The ethnographic detail is illuminating; the argument subtle and nuanced. We learn not only about conflicts in Turkish history, but about the complex workings of modernity." --Joan W. Scott "Institute for Advanced Study "
"Throughout the text, an eye-catching repertoire of characterizations accompanies his endeavor to place Alevism in Turkey . . . In his work, Tambar successfully demonstrates how the national framework of Turkey was constructed by creating sharp borders between those who were recognized and those who were not. This focus is of critical importance . . . It seems that the question of Alevism preserves its importance as a monitor of Tukey's political journey, which as yet continues to hover between pluralism and majoritarianism. Tambar's book, based on ethnographic research conducted in Çorum between 2005 and 2007, offers meaningful guidance for those who would like to understand this multifaceted question." 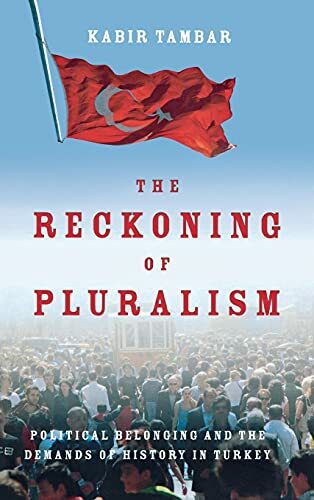 --Basim Can Sirh "Reviews and Critical Commentary "
" The Reckoning of Pluralism is a remarkable contribution to our understanding of politics of diversity and religious subjectivity not only in Turkey, but also throughout the Islamic world and beyond." --Esra Özyürek "London School of Economics "